The dynamics of Search Engine Optimization are changing by the day. What was once the process of on-page optimization, backlink building and creation of relevant content has now moved on to advanced strategies that look beyond the ideas of link building and content marketing. Looking at the present day scenario, one can see that the activities of brand building and the influencing of search engine queries are rapidly taking a front-seat when it comes to upgrading the SEO processes. With this, SEO practices are becoming more and more inclusive while thinking beyond the traditionally used methods and practices. 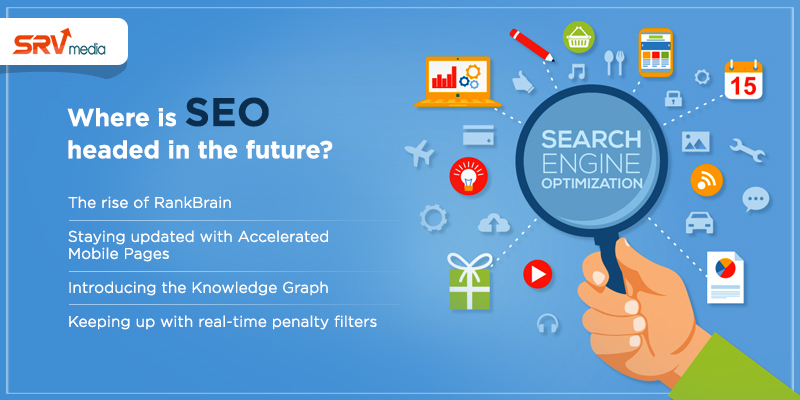 Here’s what the upcoming scenario of Search Engine Marketing is expected to look like, with inputs from the experts at SRV Media, a premier SEO company in Pune. The famed RankBrain algorithm has greatly helped Google apply the benefits of machine learning to their SEO infrastructure. As of now, RankBrain processes every single Google search individually. This is in high contrast to it processing just 15% of the search results not too long ago. However, the very nature of RankBrain makes it impossible for developers to optimize their website(s) to match it. This has driven web-developers and SEO professionals alike to focus more upon the other SEO options that are available out there. The ‘Top Stories’ carousel of Google search results integrates content from the Accelerated Mobile Pages (AMP) project within it. Not just that, Google also displays prominent links to AMP pages in its main (organic) search results index. However, most Google users appear to be unaware of AMP as of now, which is a trend that is rapidly expected to change in the very near future. The Google Knowledge Graph and Rich Answers are two of the projects that are attempting to categorically organize information around the world in order to make it globally accessible to one and all. This in turn is expected to enhance the search engine’s capabilities with respect to semantic-searches in a multitude of ways. Currently, 40% of Google search queries display Rich Answers that include a variety of featured snippets of information which are highly relevant to the given search query. These numbers are expected to increase rapidly in the years to come. Google search now includes real-time mapping of content across all of your web pages. This means that your web-page would be refreshed and re-indexed every time Google crawls or re-crawls across it, all in real-time. This is a great technique in that it helps clean up spammy backlinks and poor-quality content. This gets all websites to improve their quality in the face of a penalty that includes everything between low rankings to being dropped off Google’s searches altogether. This is a key development that is expected to highly influence SEO practices of the future. We hope you’ve learned more about the changing approaches to Search Engine Marketing and what one can expect in the very near future of SEO – through these highly excellent inputs provided to us by SRV Media, a top-tier SEM company in Pune. Thank you for reading! Next story How Well Is Your Website Optimized For Voice Search? Previous story Here Are The Best Ways To Be An Effective Social Media Marketer In 2017!